Rent Sharespace | Corporate Events | Wedding Locations, Event Spaces and Party Venues. 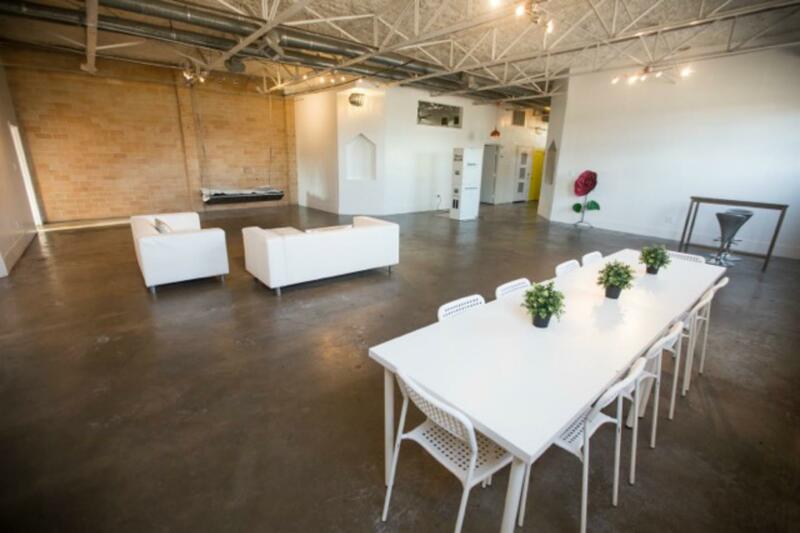 Our Blank Canvas Warehouse is our original location located in the heart of East Downtown. White wall simplicity makes it fresh and ready... Go as-is for artsy events or Splash your own lights, color, and cloth for a complete up do. You can do just about anything with this space! What comes with the space? Q: What's the size of the space? The entire space is 3000 sq ft.
Q: How much of the space do I get access to if I'm booking a private rental? When you book a private rental you have the entire space privately. You will have access to the Main Room, the Kitchen, the Front Room, and two bathrooms (everything but the 3 bedrooms). The bedrooms will be locked if you are not staying overnight. If you are staying overnight, you will have keys to the bedrooms as well. Q: Can I tour the space? Q: How many people does the space fit? It depends on the layout. Standing room with minimal setup fits 200-250 at one time. You can fit about 100-110 seated in chairs and 60-70 seated at tables and chairs (we provide the 16 rectangle tables and 70 chairs). Q: Is it okay to bring outside food and drinks? Q: Can we move the furniture? Can the swing be moved? Yes, you can move the furniture to fit your style! The swing cannot be moved. It’s a crowd favorite anyway. Q: Am I expected to clean after my event? Yes. There’s a cleaning fee of $85 for all rentals which covers Sharespace cleaning the bathrooms and mopping the floors. You are responsible for a general clean up after your event. Q: Is it okay to have live music/a DJ/loud music? Q: How do I book the space? Visit our website www.sharespace.co/preston click on the calendar to choose your date/category. Hit the "book now" button right below and it will walk you through the rest! Q: Do you have WiFi? Q: Can I add setup time/get in the space earlier to drop things off? Your setup time is the start time of your rental, the time you have booked to walk in the door and the time your door code will become active. You can find it on your invoice as “start time” if you aren’t sure when it is. Your setup time is very specific and we ask that you plan according to that time for all setup that’s needed. Q: What is parking like? Parking is great, especially for being so close to Downtown. The private driveway parks up to 4 cars. The rest is metered street parking or any free street parking available. There’s also a large paid parking lot to the right that typically charges $5 per car unless there is a game or event in the area. Rates for this lot are subject to change. We are not affiliated with them and unable to guarantee their pricing.